Few of the works on fossils appearing in early American works for children try to place humans into the geologic record. Most agree that the iguanodons, mastodons, and other prehistoric creatures then being discovered predate the appearance of humans on the planet. The Young People’s Mirror, however, includes a discussion of tracks in sedimentary rocks, with an illustration of two apparently human footprints in shell-laden limestone. “Fossil Foot-Prints” pairs Henry Schoolcraft’s description of the impressions with a lively discussion of the researches of Dexter Marsh, who was inspired to trace fossil tracks through parts of New England. The reader is left with a rather confused sense of the past. In what would become Missouri, a shoeless human walked a trackless shore; in what later would be Massachusetts and Connecticut walked birds large enough to swallow that human like a tasty grasshopper. What were the illustrated footprints? That seems to have depended on the observer. Schoolcraft saw the impressions of muscular human feet, made in a soft surface that subsequently hardened. George Rapp, founder of a millennialist religion, saw the footprints of Jesus Christ or of the Angel Gabriel (the petroglyphs are also known as “St. Gabriel’s footprints”); in 1818 or 1819, he had that part of the slab broken off and transported to what became New Harmony, Indiana, where it remains. (A photograph is included in The Petroglyphs and Pictographs of Missouri, by Carol Diaz-Granados and James Richard Duncan [Tuscaloosa: University Alabama Press, 2000]; see plate 21 and pages 11-14.) The “prints” are finely detailed, but there are dozens such in Missouri alone. Native Americans certainly didn’t need Schoolcraft’s chisel to create tracks when diligent pounding or rubbing with a harder stone would do the job. The “human footprints” are also mentioned on page 139 of The Wonders of Geology, published four years earlier by Samuel Goodrich. 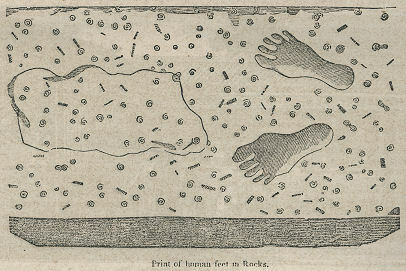 Print of human feet in Rocks. In “Schoolcraft’s Travels in the central portion of the Mississippi Valley,” page 173, we find the following interesting description of two apparent prints or impressions of the human foot in a tabular mass of limestone, at New Harmony, Indiana. The stone had been previously conveyed from the banks of the Mississippi, at St. Louis, and carefully preserved in an open area. “The impressions are, to all appearance, those of a man standing in an erect posture, with the left foot a little advanced and the heels drawn in. The distance between the heels, by an accurate measurement, is six and a quarter inches, and between the extremities of the toes, thirteen and a half. But by a close inspection it will be perceived, that these are not the impressions of feet accustomed to the European shoe; the toes being much spread, and the foot flattened, in the manner that is observed in persons unaccustomed to the use of the close shoe. The probability, therefore, of their having been imparted by some individual of a race of men who were unacquainted with the art of tanning skins, and at a period much anterior to that to which any tradition of the present race of Indians reaches, derives additional weight from this peculiar shape of the feet. iting the muscular marks of the foot with great precision and faithfulness to nature. This circumstance weakens, very much, the supposition that they may possibly be specimens of antique sculpture, executed by any former race of men inhabiting this continent. Neither history nor tradition has preserved the slightest traces of such a people. For it must be recollected that, as yet, we have no evidence that the people who erected our stupendous western tumuli possessed any knowledge of masonry, far less of sculpture, or that they had even invented a chisel, a knife, or an axe, other than those of porphry, horn-stone, or obsidian. Dexter Marsh, a laboring mechanic of Greenfield, many years ago discovered, on the flagging-stones with which he was laying a sidewalk, what appeared to be the foot prints of some strange bird. The geologists pronounced them to be such, and to belong to a period before the creation of man. The discovery so excited the curiosity and scientific ardor of Mr. Marsh that he has since made it his amusement to look for such impressions, and has traversed the valley from the Northern Massachusetts line to Wethersfield, Connecticut—sometimes spending weeks in quarrying rocks with the sole view of discovering these ancient tracks. In Silliman’s Journal of Science he gives a brief account of his labors and successes, from which we may understand that the Connecticut valley, in by-gone ages, was a favorite resort of birds that would have made no more of putting a man into their crops than turkeys do of swallowing grasshoppers. Mr. Marsh has in his possession more than 800 foot-prints of birds and quadrupeds, besides having furnished many specimens to others in this and other countries. In some cases these impressions are so distinct as not only to show the joints of the toes, but the perfect impression of the skin. He has perfect tracks of quadrupeds so small that a half-dime will cover the whole foot; and again others of birds where the foot measures half a yard from the toe to the heel, so that if the birds which made them were proportioned like those we have now, they must have stood twenty feet high! He has sometimes followed the track of a bird thirty or forty feet in the rock, the track being first faint, as if on hard soil, then more distinct, as if imprinted on the sand at the water’s edge, and finally sinking into the mud and disappearing into the water. He has one slab, four or five inches thick, on which the tracks appear as mere straight lines upon the surface: but on splitting it into five layers they grew more and more distinct, till the lower slab shows where the foot rested—just as if, when the stone was in a state of mud, the bird trod down to the bottom of it, and on withdrawing the foot the mud closed up. Among these tracks are many very unlike to those made by any known animals, but still so marked as to leave no doubt that animals made them. A sort of kangaroo, for example, shows very small fore feet and very large hind ones.